Earl Finch met his first Japanese American G.I. in the summer of 1943. He had closed his Hattiesburg, Mississippi store at the end of the day and was walking to his car, when he noticed several small men wearing ill-fitting American uniforms. He approached one of the men, Richard Chinen, who was peering through a store window. “Welcome, soldier,” said Finch, whose greeting soon included an invitation for dinner. Finch was the proprietor of the Earl Finch Company, which offered “Work Clothes, Army and Navy Goods, Sporting Goods” to thousands of American soldiers who trained at nearby Camp Shelby. While only 27 years old, he was an experienced and accomplished businessman, having had to leave school at age 10 to help support his family. In addition to the store, Finch owned a bowling alley and second-hand furniture store, but he wasn’t a wealthy man. Content to live with his aging parents in the southern Mississippi town of 25,000, he was shy, with few friends. Finch, a bachelor, didn’t drink or smoke and had never traveled farther than 100 miles from home. Finch had tried to volunteer for the U.S. Army but was rejected because of a heart ailment. When his younger brother, Roy, was inducted and shipped out, Finch decided that his patriotic duty was to offer hospitality to soldiers. Reasoning that foreign troops were in the most need of friendship, Finch entertained Chinese airmen and French and British seamen in New Orleans on several occasions. In the past, Finch had invited soldiers to his home, but never saw them again. Therefore, he was pleasantly surprised to return the next afternoon and discover the Hawaii boys on his porch talking and laughing with his mother. In addition, the men had purchased roses for her in appreciation for the previous night’s hospitality. The small token of gratitude impressed Finch immensely. Finch soon recognized that more than any other group of soldiers he had encountered, these Nisei (“second generation” in Japanese), children of Japanese immigrants, appreciated the democratic values they were fighting for. Finch committed himself to helping the young Nisei gain acceptance in his hometown. The Finch home was too small to accommodate more than a few soldiers, so he purchased a 350-acre ranch outside of Hattiesburg. 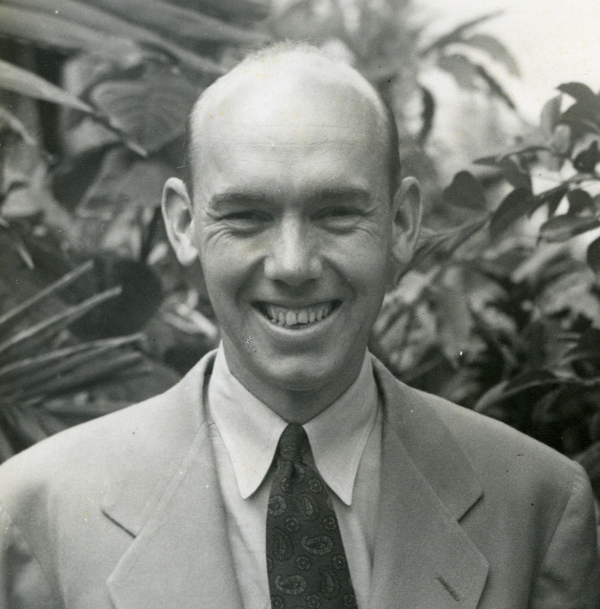 At first, Finch limited his generosity to the Hawaii soldiers, reasoning that they were the farthest from home. He soon learned, however, that mainland Nisei carried an additional burden: They had volunteered directly from U.S. internment camps, leaving their parents and siblings still unjustly confined behind barbed wire. Most of them had little or no money. Over the next few months, Finch entertained several thousand soldiers—from both Hawaii and the mainland, staging several large events at his ranch such as barbecues, watermelon picnics and even a rodeo to which he invited 600 soldiers. To make them feel at home, Finch imported Japanese food products like shoyu, bamboo shoots, tofu and Asian vegetables from Chinese restaurants in Chicago and New York. He imported mangoes from Bermuda and pineapples from Cuba. He even butchered a cow so that the soldiers could enjoy a meal of sukiyaki. In addition, although Finch did not have a personal interest in sports, he became deeply involved with various athletic programs because the 422nd included some of the best athletes in the country. Finch was the team sponsor of the 442nd team that won the Camp Shelby baseball championship. When Finch heard the Southern Amateur Athletic Union Swimming Championships were being held in New Orleans, he arranged for ten Nisei swimmers to compete in the event. He rented a truck and made arrangements for the team to practice at the swimming pool of nearby University of Southern Mississippi. He paid for the train fare as well as their stay at the posh Roosevelt Hotel. Although they were out of shape, the Nisei swimmers dominated the best Southern swimmers to win the team title. Finch was also among the individuals who helped secure the location for a separate club which would serve the Nisei soldiers. The “Aloha” USO in Hattiesburg was opened and operated by the wives of several soldiers who had relocated there. Finch was at the club practically every day and received some 200 letters per week there from Nisei soldiers, their families and friends. The correspondence often included small donations to help finance his charitable activities. By September 1944, the soldiers of the 100th Infantry Battalion had entered combat, suffering heavy casualties in the Italian campaign. The following June, the 442nd RCT joined the 100th in combat. Finch, who had become the executor for some 1,500 wills, sadly received death notifications of his friends. He visited many of the grieving, Issei (first generation) parents in internment camps. (At war’s end, Finch would also assist former internees returning to the West Coast, helping them find jobs or giving them loans to relocate and start businesses of their own.) To those he could not meet, he sent messages and flowers. Because of the high casualty rates for both the 100th and the 442nd, in one year, Finch traveled some 75,000 miles across the nation, visiting soldiers recovering from their wounds and their parents. Among the many whom Finch called upon was 26-year-old First Lieutenant Spark M. Matsunaga of the 100th, who was recuperating from his injuries at Fort Snelling, Minnesota. “As soon as he heard that I and several other wounded officers were there, he came up from Mississippi to visit us,” Matsunaga recounted years later when he was a U.S. Senator. With ukuleles, bass, and hula dancer (Ken Okamoto of the 442nd performed in a grass skirt), the Shelby Serenaders entertained the wounded at the Halloran General Hospital in New York. On August 12, 1944, they held a second performance at the Walter Reed Hospital in Washington, D.C. Many patients were members of the 100th/442nd. Finch decided to sponsor a tour of the band, which ultimately traveled some 35,000 miles and performed for approximately 25,000 wounded soldiers in hospitals around the country. 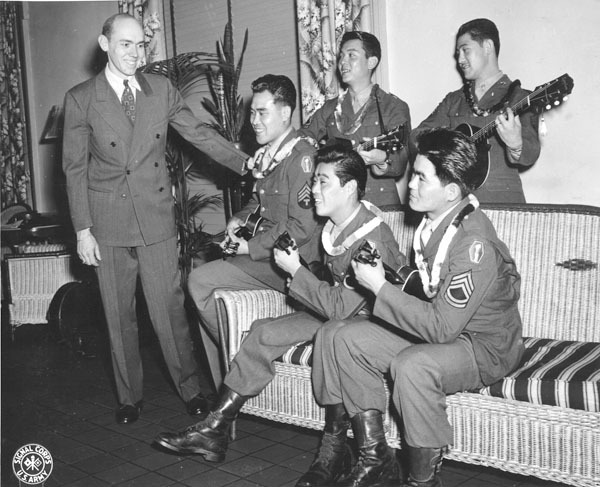 In January 1945, Finch reserved the ballroom at the Hotel Astor in New York and threw a huge bash with Hawaiian music and hula for 150 returning soldiers. The event prompted The New York World-Telegram to dub Finch a “One Man USO.” In June, Finch threw another party in Chicago, inviting Nisei veterans from hospitals in Chicago, Michigan and Utah. A month earlier, Germany had surrendered, ending the war in Europe. 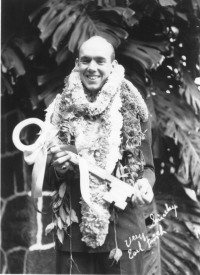 On March 5, 1946, Finch visited Honolulu and was greeted with the largest and warmest reception ever given to a private citizen in the history of Hawaii. For 25 days, island families toasted their friend from Hattiesburg. In the three months following his Hawaii visit, Finch visited an additional 3,000 hospitalized Nisei soldiers in Philadelphia, New York, and Chicago. Despite his busy schedule, Finch was in the nation’s capitol on July 15, 1946, when the 100th/442nd received the Presidential Unit Citation from President Harry S. Truman.